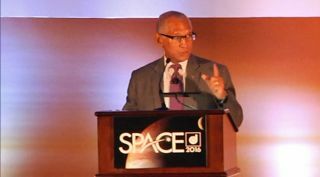 NASA Administrator Charles Bolden spoke on the need for international cooperation for space exploration at the 2016 AIAA Space and Astronautics Forum and Exposition in Long Beach, California on Sept. 13, 2016. LONG BEACH, California — NASA Administrator Charles Bolden quoted a poet and a songwriter in a speech he gave yesterday (Sept. 13) describing the need for collaboration in spaceflight. "One of my favorite singers, Norah Jones, once said that making music is at once part social, part interactive, part collaboration," Bolden said during his talk at the AIAA Space and Astronautics Forum and Exposition (SPACE) meeting in Long Beach, California. "The history of the space program suggests that the same can be said about human progress." Speaking alongside Bolden was Steve Jurvetson, a partner in the investment firm Draper Fisher Jurvetson, which provided early investments in SpaceX and Planet Labs; and Winston Beauchamp, the Deputy Under Secretary of the Air Force for Space and Director, Principal Department of Defense Space Advisor Staff. Bolden opened his talk by saying that he believes it "says something powerful about AIAA" that the organization opened the meeting with speakers representing different parties involved in the field of spaceflight. He then called on the meeting attendees to value collaboration in their own pursuits. "In the days, months and year ahead, each and every one of us who are part of the space exploration, space policy, and space business communities have an important choice to make," Bolden said. "It's actually a fairly simple choice — although don't let simplicity distract from importance. The choice is this: Alone or together?" NASA has always collaborated with private industry in its efforts to explore the universe, but a new kind of collaboration has been taking shape in the past few decades, as NASA is pushing for private companies to take up more responsibility for sustaining the economy of low Earth orbit. "In the mid-2020s, as we transition much of our government human exploration workforce from the space station to deep-space missions, it is our hope and our goal that the commercial market, which is emerging in low Earth orbit today, will become self-sustaining," Bolden said. "The idea is that NASA will facilitate this transition, following the pattern that existed since the earliest days of the space program. NASA and private partners pioneer, develop and demonstrate new technologies, and then we turn things over to the private sector, while we move deeper into the next stages of exploration." Other speakers at the meeting discussed the ways that private industry might take over the responsibility of maintaining research opportunities in low Earth orbit; the US, Japan and Russia are committed to maintaining their current level of support of the International Space Station (ISS) through 2024. In the future, companies may support the station, or utilize new stations (that may or may not house humans). Bolden's prime example of the power of collaboration was the international cooperation that has helped maintain a human presence on the ISS for 15 years. Bolden said he has stated before that he believes the station should win a Nobel Peace Prize. (He assured the audience that this is a serious suggestion, even though some people think he's joking when he brings it up). The station was built and operated by "thousands of people" from 15 countries; hundreds of people from 17 countries have visited it; and it has hosted science experiments from scientists in 83 countries, Bolden said. He went so far as to tell a story about visiting Russia when astronaut Scott Kelly and Russian cosmonaut Mikhail Kornienko returned from their yearlong mission aboard the ISS earlier this year. While there, "a very high-level official in the State Department" asked Bolden how the US and Russia managed to collaborate so well in space, considering the tensions between the countries on the ground. Bolden said he told the person, "I think we've focused on a common mission. And when you put people together to do that, you find that you get different results than when you can't find commonality." The need for collaboration between the public and private sector was on display at the meeting, but Bolden also reminded the audience of the power of space to create collaborations and connections between people. He quoted the poet William James: "We are like islands in the sea, separate on the surface but connected in the deep." "I like to tell people that, from the vantage point of space, where I've been privileged to go, you get to understand that we live in one ocean," Bolden said. "The common experience aboard the ISS has taught us that we're connected not only in the deepest depths of the sea, but also in the vastness of space."